If you are one of the millions diagnosed with cancer you probably live in fear that cancer will return. 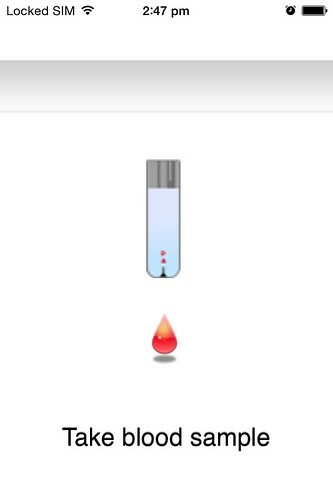 Matrilyzer is a device to monitor your potential risk by using your iPhone or iPad and nothing more than a drop of blood a few times per week. Our app measures collagenase, an enzyme in the blood that has been studied extensively in cancer patients. Results are sent securely to the cloud and both patients and doctors can monitor the results. Early detection is key in preventing cancer cells from metastasizing, or spreading to healthy tissue. If doctors can catch this happening early on, there are potential treatments available. Matrilyzer wants to give people living with cancers access to better information, make them feel more in control about their bodies and get the right treatment earlier and more effectively. Matrilyzer is a mobile app and device that attaches to existing iPhones, iPods or iPads. It is designed for patients to monitor a substance in the body (an enzyme) called collagenase, which is released by existing tumor cells allowing them to spread to new parts of the body by breaking down the matrix that holds healthy cells together. Matrilyzer will enable patients to monitor their collagenase with one drop of blood, 3-4 times per week in just 3 minutes. It is currently the first product to have the potential to measure with high accuracy these levels. When the amount of collagenase increases in the body, it suggests to doctors that new cancer cells might be growing in other parts int he body. Collagenase has been studied for a long time in cancer patients, and suggests that cancer cells are leaving the primary site, invading distant healthy tissue, and forming new tumors. Matrilyzer is the first product that has the potential to test with high accuracy the levels of collagenase in the blood at home. In the U.S alone, there are more than 12.5 million people living with cancer. Many of them live in constant worry that the primary cancer could spread out and metastasize, or grow again in a new place inside their body. Matrilyzer will help patients easily measure collagenase from their home, in private in just a few minutes per week. That data can then be used as more information for doctors to potentially run scans, consults or prescribe treatments. Ultimately, Matrilyzer will give patients more peace of mind and the possibility of early detection. The test takes 3 mins and happens in 3 steps. 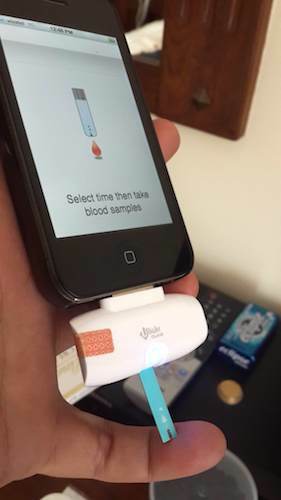 Patients take a small drop of blood using a finger stick device you can buy at any pharmacy, and place the tiny amount on our proprietary test-strip. The data (including ambient temperature) is recorded by the iDevice and uploaded to a highly secure server. Over time, patients can login to the secure website and see their results. Any persistent jump in readings would then be an indication to go to the doctor for more detailed tests. While we cannot say at this time what the normal amount of collagenase is for any patient, because it depends on multiple factors, testing for collagenase consistently over time provides better evidence for a doctor to run the right tests if there is an increasing trend. No absolute one-time reading would be expected to provide enough information; it is our goal to make Matrilyzer a device that is used for cancer patients as commonly and frequently as a glucose meter in diabetes patients. What is the meaning of Matrilyzer readings? Absolute level of collagenase activity varies from person to person, and is influenced by other processes such as wound healing or other tissue damage. With regular monitoring, however, Matrilyzer may be able to detect consistent trend elevation, suggesting cancer cells are spreading to healthy tissue inside the body. Matrilyzer is in development and we are gathering data to get full FDA approval and make it available cancer patients and survivors as soon as possible. Your data will help prove that Matrilyzer works sufficiently, and will help tens of millions of people to screen for early metastasizes. Through our development process, Matrilyzer measures collagenase in a sensitive manner. Upon enrollment in our pilot program, you will receive one Matrilyzer device and fifty disposable tests. Matrilyzer is an attachment for iPhone/iPad/iPod, so you will need one of those. The Matrilyzer app is available for free from iTunes. For getting blood through finger-stick we recommend off-the-shelf lancing devices that are available for glucose testing. Matrilyzer will give you new data about your body that might lead you to get better medical attention. While the product is still in development, and is no substitute for medical scans, consults or prescriptions, Matrilyzer is the first at-home product to test for collagenase, an early indicator that cancer cells are starting to break down healthy tissues . When you start to see new trends in your results, you can call your doctor and ask he or she to follow-up. A three minute test, 3-4 times a week has the potential to provide valuable help in your battle with cancer. You will also help the Matrilyzer team and the world by contributing your anonymous data. 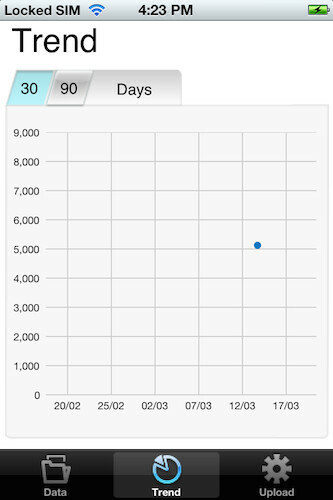 With each new user, we get closer to reaching a threshold for validating the significance of testing. How will it help Doctors? Matrilyzer has the potential to save or prolong your patients lives. With clinical data that you never had access to before, you will be able to identify high risk patients faster, more effectively and prescribe the right tests and treatments. Imagine having every patient in your practice using Matrilzyer and software that constantly monitors the level of collagenase in their bodies. When unforeseen trends start to show up, you will know which patients to contact first and the right tests to order. How will it help Hospitals and Clinics? Imagine every single oncologists in your entire practice, and every single patient that comes through your institution for cancer treatment is given a Matrilyzer. How will Matrilyzer help Partners? In our development process we want to gather thousands of patients data and find the right partners to help us bring it to market faster and more effectively. Our data set could be used to inform drug development and effectiveness. Academic institutions could run analysis on adherence. The possibilities for Matrilyzer extend beyond individual patients, but the cancer population as a whole. We also want Matrilyzer to be affordable and accessible. We are also open to partnering with distributors. Matrilyzer will use the funding to complete manufacturing and further develop our web platform. It will help us with to refine and optimize the test, and scale-up manufacturing. In addition, it will help us with the cost of maintaining our patents. Matrilyzer is a product in development; the FDA or any other regulatory agency has not approved it. Test results are for information only, and are not substitute for any other tests, scans or exams that your doctor would prescribe. Your participation in the Matrilyzer pilot program does not require you to submit personal information such as name and addresses. However, we will has access to the test results data and use it to improve the test and evaluate its clinical significance. If you have any questions about the device or data gathering process please email or contact us. EARLIEST DETECTORS: Help be the first to sponsor a Matrilyzer purchaser and receive a $250 discount on a device. Matrilyzer will send you or yourr cancer survivor the a beta version of the prototype, 50 disposable Matrilyzer tests, the Matrilyzer iOS app and website access. Thank you for your support. EARLY DETECTOR: Be the first to get a Matrilyzer device and receive a 50% discount. 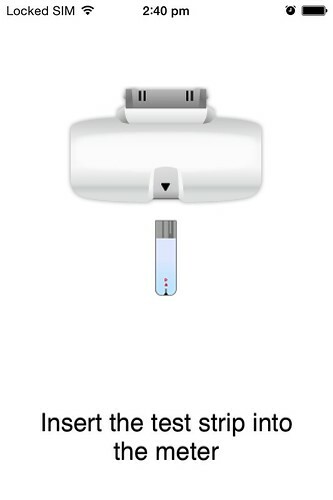 As our first Matrilyzer users, will send you a beta version of the device, 50 disposable Matrilyzer tests, Matrilyzer iOS app and website access. You will be the ones who help us and the world continue to fight cancer everywhere. PATIENTS: Be a Cancer Fighting Warrior! As our first Matrilyzer users, will send you a beta version of the device, 50 disposable Matrilyzer tests, Matrilyzer iOS app and website access. You will be the ones who help us and the world continue to fight cancer everywhere. DISTRIBUTORS: We want Matrilyzer to be in the hands of every cancer patient and our physicians to access the data. If you're a manufacturer and want to be involved in the production of our device or test strips, we will grant you first right of refusal. Please email or contact us through MedStartr for details.